The Scottish Sea Life Sanctuary has confirmed it is to close at the end of next month, almost 40 years after it first opened. Merlin Entertainments blamed a decline in visitor numbers at the attraction in Oban, Argyll and Bute, for the move. 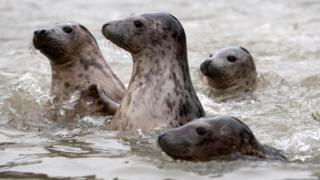 The company said there was no viable way to keep the centre open and said the animals would be transferred to Sea Life Centres in other parts of the UK. The attraction, which opened in 1979, will shut its doors on 31 October. A statement on the Scottish Sea Life Sanctuary website said: "Sadly visitor numbers to the attraction have been in decline and after comprehensively reviewing every possible option, there isn't a viable way to sustain the significant investment that is required in order to keep the sanctuary open. "Therefore we have come to the sad conclusion to close the sanctuary on the 31st October 2018. "This was an enormously tough decision which has been reached with a heavy heart and with the utmost consideration." It vowed that the welfare of the animals would remain its focus and confirmed that the transfer would involve vets, marine biologists and logistics experts. The statement concluded: "We'd like to say a huge thank you to all our staff who have been incredibly understanding and have shown amazing commitment and team work over the years. "We also want to thank all our wonderful guests for their support." The company confirmed 11 staff currently work at the sanctuary and said they may be offered the opportunity to work elsewhere in the business.